Intrepid Travel, the Tui Travel-owned adventure holiday specialist, is claiming impressive engagement levels for its adventure.com online community, reports Travolution. The site, which is currently in test mode in north America, was launched only last July after the firm was presented with the opportunity to buy the domain 18 months ago. James Thornton, managing director of Intrepid Travel, said already it has attracted 245,000 Facebook fans and 470,000 hits on a YouTube ‘hero-piece’ video. The firm also claims it has five times the level of engagement of high profile brands like GoPro, the digital video camera manufacturer, and drinks firm Red Bull. 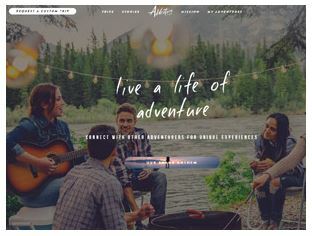 Thornton said: “We are very conscious that content is key in building a community and we thought it was great to trial this in the adventure space – create a lifestyle brand. Michael Edwards, UK and Europe regional director of Intrepid Group, said it would assess traffic to the community to see what interest there was in other global markets. Meanwhile, day-tours specialist Urban Adventures, winner of the 2014 Travolution award for Rising Brand, has dropped its signing-on fee for new guides as it looks to expand geographically. The operator, which sells most of its tours through the trade, has targeted 70 cities worldwide for expansion, including London, Belfast, Dublin and Edinburgh. It currently offers 368 tours in 103 destinations, providing local tour guides with technology, health and safety and customer services support. Thornton said Urban Adventures had grown by 50% over the past five years. This year, it will carry 100,000 customers as it expands beyond its core destinations in southeast Asia. Thornton said Intrepid’s portfolio of adventure travel brands was becoming increasingly popular among agents, particularly OTAs, as they looked to differentiate their offering and meet customer demands. “People travel to cities and often they want to do something a bit more experiential,” he said. “It’s a great product for people who have not been interested in this sort of thing before, but want to test something for four to six hours. Urban Adventures guides are not expected to have a background in touring, but must have a passion for their destination. Popular themes include local food, which involves customers going to a family dwelling to enjoy home-cooked food.Thornton said the firm had enjoyed particular success integrating its product with online, as well as having commercial deals with all the UK’s main agency groups. “Many traditional agents are not familiar with selling this type of product, but it is one way to add value for clients,” he added.